Barnacles are a crustacean that live on hard surfaces like rocks on the shore or on the bottom of boats. They are called acorn barnacles because they are cone shaped. They grow themselves onto the rock that becomes their permanent home. They usually are about 1.5cm long and are an off-white colour. They are made up of 6 plates that surround, and protect, the body. They close these plates when the tide is out to stop them from drying out. They have 6 small, feathery legs that they use to filter the water for food, but they also use them to move when the tide is in. Their main diet consists of plankton and detritus. They are hermaphrodite, which means they are both male and female. Their eggs are carried in a special cavity for about 5 months. When ready to hatch the larva swim freely in the sea as zooplankton. Once they have grown big enough they will attach themselves to rocks like their parents. 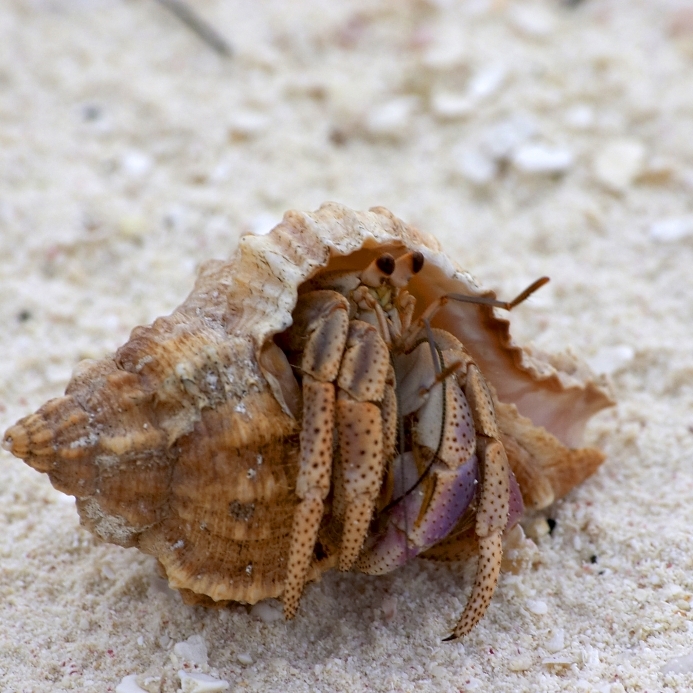 A cockle has a soft body enclosed in two hard, thick shells, about 4cm long each. It is called a ‘bivalve’ mollusc. The two shells are of the same size and shape (semi-spherical) with a ribbed surface of around 25 lines. They are usually an off-yellow or brown colour with a white inside. The inside sometimes has a brown or purple tint to it. They have a long, strong, muscular foot that they use to jump when moving. This foot can sometimes be as long as their shell, but is kept bent under the shell and straightens to jump. Cockles live in sandy sediments, about 5 cm below the surface, meaning they can move quickly if needed. There are two types of anemone found in British rock pools: the beadlet and the plumose. Thebeadlet anemone is normally red (can be orange or green) and is covered with on average 200 stinging tentacles. They are normally about 5cm long with blue dots/beads at the base of each tentacle. These tentacles are used to sting their prey, therefore are only seen when it’s feeding. When threatened or when the tide is low the anemone retracts its tentacles to protect itself from danger or from drying out. If the beadlet anemone wants to move it inflates itself in high tide and allows the currents to carry it to a new location. The plumose anemone also has stinging tentacles but this time they are on top of a long (30cm high) column. They are normally white or orange-pink but have been found yellow, dark green, brown, a reddish colour and grey. They have much thinner tentacles – almost feathery like. This anemone is not just found in rock pools, it has been found almost 100 metres deep in the sea, on shipwrecks, on sewage pipes and piers. Plumose anemones also retract their tentacles when exposed to air or threatened. These anemones can move, but very slowly and they sometimes leave fragments of itself behind. These fragments then develop into fully grown plumose anemones. Starfish are not native to the English coast but are found here. They live in the Atlantic and occasionally the Mediterranean seas. Starfish thrive in areas with lots of bivalves as these make up most of their diet. They don’t have a head but instead they have a centre attached to five symmetrical ‘feet’. Their size is from 10-30cm and is normally a sandy colour with white tipped extremities. Their spine exists just below their skin with tiny bone plates sticking out of their skin giving them a spiky texture. They move using hydraulic pressure created by their fluid filled feet. 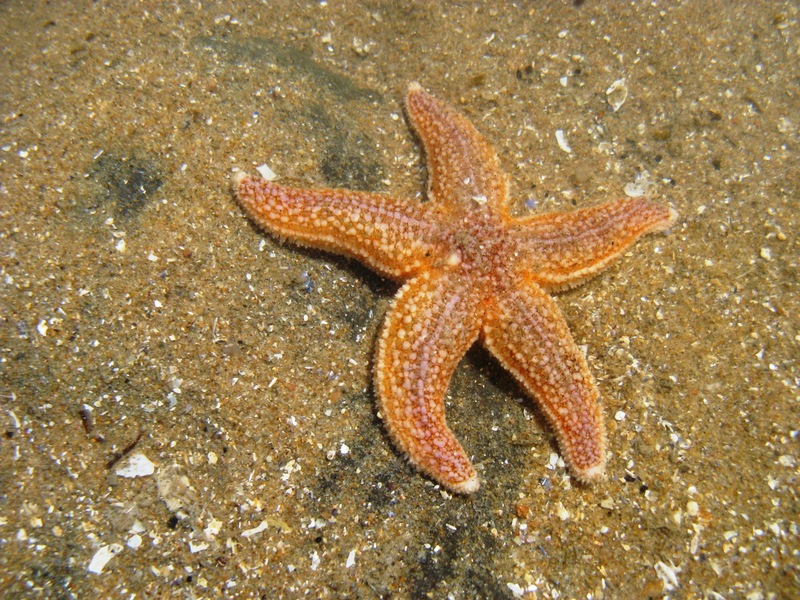 Starfish can also re-grow arms with only one arm and the centre left. Starfish reproduce by shooting sperm and eggs into the water at the same time. The eggs then float in plankton for two weeks, and then they settle down on the bottom of the sea bed to develop. Sea horses are found across the east north Atlantic, Mediterranean andBlack sea. The sea horse gets its name from the horse shapedface and pipette-shaped mouths. They have bony-plates that protrude across their body. They can be black, grey, brown, white, yellow and red. They are up to 16cm long and swim upright, unlike other fish they are propelled by tiny fins. They live in eel grass and seaweed and feed on plankton. Sea horses breed by the female laying her eggs in the male’s brood pouch. The male then carries the eggs until they hatch. They are brought in by the sea and sometimes stranded in rock pools until the next high tide. This small fish can be found hiding under rocks and in tiny caves within the pool. It can bask in the sun on weeds outside of the water. This is only possible if it is moist, when it starts to dry out, or if it is disturbed, it will jump back into the water. It stops itself from drying out by having a layer of slime and it is also scale-less. Its skin is a similar pattern to that of the rock pool – it can be grey, yellow, green or brown with dark markings. Blennies can adapt their colour to the colour of their surroundings. 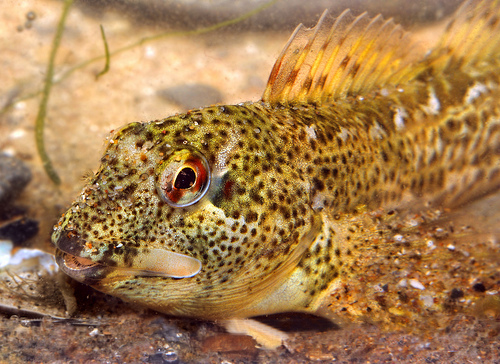 Common Blennies reproduce by laying eggs under crevices in the rock pool. The male Blenny guards the eggs until they hatch. Gobies are found fromNorwaytoPoland. They are a small coastal fish that can reach a length of 6cm and are a sandy colour, which helps camouflage them. When mating the male has a dark spot on the end of his first dorsal fin. Their diet consists of small crustaceans, worms and skeleton shrimp. They thrive in shallow sandy areas. Breeding season is from March to June. They lay eggs under a shell which the male Goby guards until they hatch 11-14 days later. 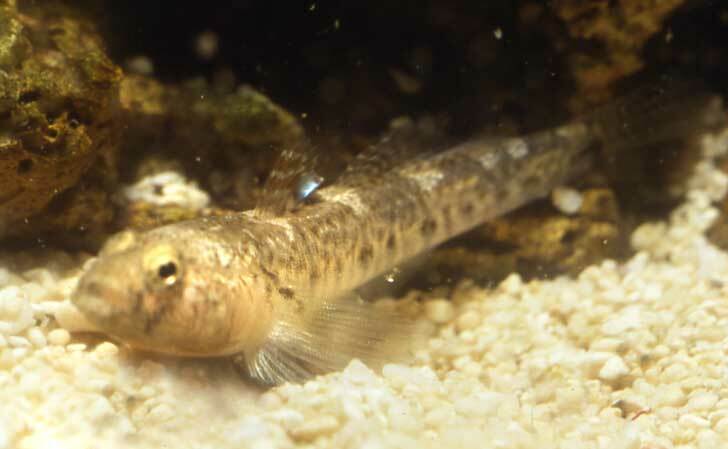 Gobies have a life span from 12-15 months. The Common Limpet is found across theUKrocky shore line, living on hard surfaces likes rocks in rock pools. They have a conical shell that protects them from the waves and allows them to graze on microalgae. They are about 5cm wide and have a light grey/sandy colour, horizontally/cylindrically striped shell. They are very territorial and move within this area, but lock into position when it is low tide. You may see circles around the limpet- this is their territory, it has been carved due to locking themselves against the rock at low tide. 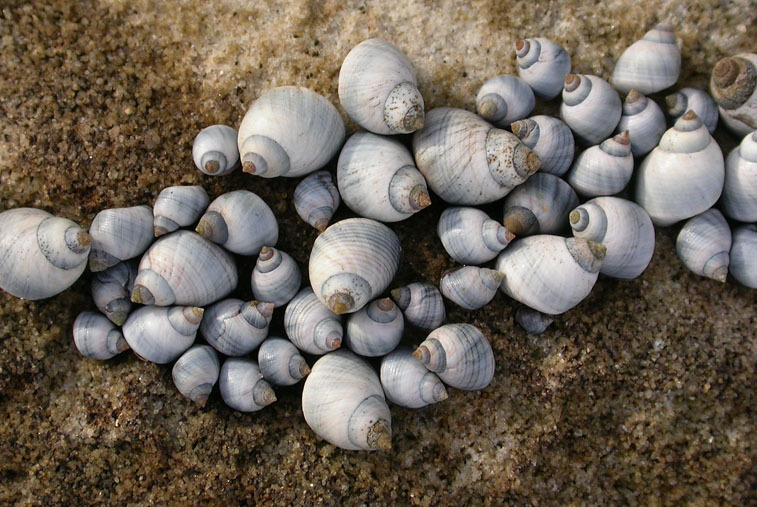 The Common Periwinkle is about 4cm long and has a hard spiral shell that is normally grey, or variations of grey. They graze on algae and seaweed. They can also survive outside of water by closing a horny plate. This means that the periwinkle doesn’t dry out. They also have a slightly converted lung which is a gill chamber. The common shrimp is found acrossEurope. It has a almost see through body but has pigment cells (chromatophores) in its skin that allow the shrimp to change colour. They have 4 walking legs that all have claws, which they use to catch their prey with. They also have long antennae that allow it to sense movement. Shrimp also have well- developed eyes and a tail like a fan. Their diet consists of small molluscs, plants (occasionally) and fish. They are nocturnal creatures that stay in dark shallows in the day and then feed at night time. If you are very lucky you may find a cancrid crab- edible crab. These crabs can grow up to 30cm across. They have a distinctive oval body (carapace) with a ‘pie’ crust like, toothed edge. Their colouring is normally orange with yellow highlights. They have dark black big claws used for catching prey on the sea bed. Their diet consists of other invertebrates and other dead remains. Due to them being consumed by humans they are rare to see, so if you do see one you are very lucky. This is a rare sighting, but one that can be done. Spider crabs have a triangular body with a spiky surface. They have a peachy-orange shell that ranges from 8mm to 50cm long. As their name gives away they have long spidery legs that have pinchers on the end of two. They live on the sea bed and camouflage by attaching debris, sponges, seaweed and detritus against their body. This is a way to protect them from predators. Spider crabs are found in all oceans bar polar seas. Their ancestors inJapan(the Japanese Island Crab) are the largest Arthropod living nowadays. Their diet consists of both animal and plant matter. Unfortunately the most spotting of these animals has been from washed up shells.